A political culture, often facilitated by social media, has emerged that many people experience as authoritarian and bullying. In October 2015, thousands of South African students marched on key sites of power – Parliament in Cape Town, the seat of government in Tshwane and the headquarters of the ruling African National Congress (ANC) in Johannesburg – under the banner of #FeesMustFall. The scale of this mobilization, which included students from elite and working class universities, was impressive. There was also impressive intellectual work undertaken in struggle. The systemic under-funding of universities by the ANC government was directly confronted, as had been, in previous months, the racism that continues to fester in universities, along with the colonial logic that still characterizes much teaching and research. Moreover, the students quickly won considerable moral authority and support from trade unions, popular organizations, churches and some of the media. It was an extraordinary moment. There was a real possibility for students to constitute themselves as a significant political force and to forge mutually enabling solidarities with struggles in wider society. This cycle of student politics has been a highly dynamic phenomenon. From the beginning there were significant differences within and between campuses in terms of the ideas and forms of organization that came to the fore. Nonetheless there are some general features that can be noted. Students at historically black universities have been waging struggles, often isolated and bitter, against exclusions since the end of Apartheid. But this was the moment at which these struggles arrived in elite and formerly white universities and, simultaneously, won their first sympathetic hearing in the elite public sphere. Another general, if not universal, feature of the moment is that women and queer people have often been at the forefront of these struggles. Furthermore, engagement on social media became a significant dimension of student politics and there was a wholesale embrace of a certain kind of American political culture (safe spaces, discourse around ideas like privilege, intersectionality and micro-aggressions, etcetera). At the same time there was an often sharp generational break with the politics of the ANC and a turn to ideas and symbols gleaned from, in particular, Black Consciousness politics in South Africa in the 1970s and the contemporary global moment inaugurated by Black Lives Matter in the United States. Some of the features of the politics that emerged were, like the centrality of personal trauma, very similar to those described by Robin R.D.G. Kelly in the US. A tremendous amount was achieved very quickly. But in most cases – mass politics in terms of organization and mobilization – quickly collapsed. The reasons for this are complex. They certainly include repression, and the various interests and machinations that swiftly surround all effective popular organization. But they cannot be reduced to external factors. For one thing, acute conflicts emerged within the movement, with perhaps the most public being around questions of gender and gendered abuse. It has been argued that the failure to elect leaders allowed for a version of the tyranny of structurelessness – perhaps exacerbated by an intersection between the students’ use of social media and the official media’s predilection for making sense of politics in terms of personal celebrity. It has also been argued that a certain kind of moralism was sometimes substituted for politics – politics in the sense of what, in the struggles of the 1970s and 1980s, was called praxis. In some circles a political culture, often facilitated by social media, emerged that many people experienced as authoritarian and bullying. A set of stock phrases were sometimes used to curtail discussion and to cast approbation on the character of people with independent or not yet fully formed ideas. A good number of people committed to the goals of the movement found that they did not feel comfortable in its spaces and, often feeling wounded, they retreated from active engagement. One of the new ideas that won some support in certain circles was a particular reading of American Afropessimist theory. In some interpretations, often articulated to a reading of Fanon largely based on a few statements in the opening chapter of The Wretched of the Earth, it was taken to mean that the new world could only arise on the ashes of the old. There was a degree of absolutism at play. In some expressions it took a distinctly millenarian form. For some people talk about a conception of redemptive violence, or burning – rather than organization, mobilization and strategic action – came to be seen as the authentic radical posture. What was for some time only a form of discourse has now become a scattered practice in the sense that fires have been set – covertly rather than in riots – on some campuses. Today, the remaining actively militant students are generally a small and divided minority on their respective campuses, often politically alienated from wider society and vulnerable to repression. There is frequently an attraction to forms of disruption that can be effected by small groups of people – some of which have extraordinarily effective public interventions and some of which have been largely alienating – rather than the labor of building organization, sustaining mobilization, forging alliances and engaging in strategic action over the long haul. On Monday this week, students protested fees at the University of KwaZulu-Natal (UKZN) on its campuses in Durban and Pietermaritzburg. There is a serious problem with political violence in this part of the country and the police are notoriously brutal. As has frequently been the case with regard to student protest over the last 20 years, as well other forms of popular protest organized autonomously from the ruling party, the police response was violent and sadistic. A student in Pietermaritzburg reported that the police had raped her. 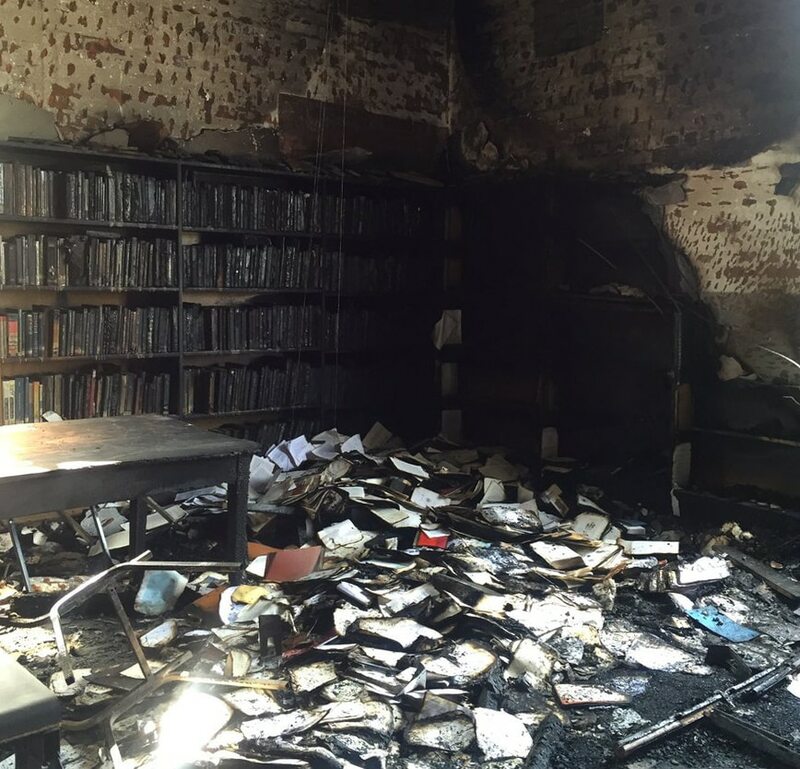 On Tuesday night, a law library was set ablaze on the Durban campus. Though firefighters brought the fire under control there was significant destruction. Many students have been strongly and publicly critical of this action. But a few of the well-known figures to have emerged from the struggles last year condemned criticism of the library burning. It was suggested that one can’t simultaneously be in solidarity with oppressed people and opposed to the burning of the library. This is not a credible position. Burning a library is neither the only nor the most effective way to oppose repression and advance the student struggle. In some cases the burning was celebrated on the grounds that the library contained colonial material. There is a reckless, and perhaps desperate, anti-intellectualism at work in this position. Where, after all, would C.L.R. James, Edward Said, V.Y. Mudimbe, Sylvia Wynter or the Subaltern Studies school have been without a colonial archive from and against which to develop their critique? There is also a real risk that the turn to burning will set the stage for further repression, worsen divisions among students and further isolate students from possibilities for political support in wider society. At the University of KwaZulu-Natal, which is R2 billion in debt and in systemic crisis, it is far more likely to compound rather than resolve a set of already acute problems. The turn to burning is not a sign of a productive new militancy. On the contrary it is symptomatic of the current weakness of the movement. If it is to recover its strength the movement will need to recover and sustain its capacity to organize and mobilize on a mass basis, to win as much of wider society as it can to its side, and to take effective strategic action. In a national and global context in which the left is weak and right wing forces, of various kinds, are often the main beneficiaries of economic crisis the scale, tenacity and strategic innovation of the political work required to win real gains needs to be taken seriously. The simplification of the meme or tweet that embraces the substitution of the fire or act of symbolic disruption, for politics qua politics – for the sustained construction of popular and democratic counter-power – will not serve us well.